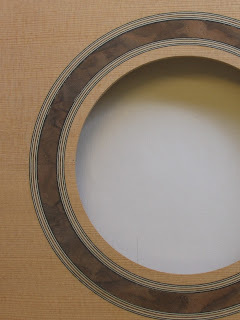 Commissioning a guitar part 2, you saw the ideas sheet that I prepared for Richard; after some consideration he made his choice for the style of rosette and above you can see a portion of it completed. It’s made from the same piece of burr walnut as the head veneer. Hopefully, you can see how I like to work with the client to ensure that they are 100% happy. The body is almost completed and I now have to consult with Richard on the final dimensions of the neck. Also the fingerboard inlays have to be decided upon. 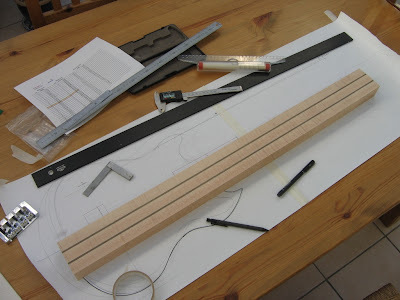 Once I know how wide the neck will be I can prepare the neck joint and bring both elements together. from highly figured maple, 2.5mm black walnut and 0.6mm green veneer. One of the first guitars that I made was a bass with a straight through neck. I made it at school when I was 17 as an ‘A’ level project. I remember watching the Old Grey Whistle Test and seeing Return To Forever with Stanley Clarke playing one of the first Alembic basses. I’d never seen anything like it and thought that I must build one like it. In those days (pre-internet) information was difficult to get hold of so most of my design was based on guess work, looking at whatever photos I could find. I made every part expect for the strings and machine heads. 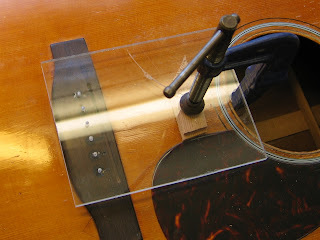 I wound the pickups by hand and made their covers from brass sheets that I had chromed plated. I also made the bridge! It served its purpose as it got me my A level pass and in to the London College of Furniture to study Modern Fretted Instruments. I eventually sold it for £60. You can see that Stanley’s Alembic still influences me! A couple of years ago, I spent some time in the USA, visiting various luthiers; one of them was Rick Turner who was one of the co-founders of Alembic. It was quite exciting to meet a guitar making hero/legend and a genuinely nice guy! 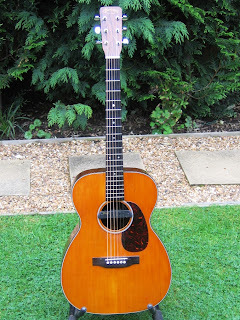 This is a 1960s Martin 00-18 that I have just done some repair work on; it’s a sweet little guitar and I’ve made some drawings for future reference. Some of my recent repair work has involved me in putting right the work done by someone else. This Martin’s bridge had been “repaired” so well that the strings could not be inserted from the front and had to be threaded through the sound hole! I cannot understand how anyone could “repair” a guitar and take someone’s money for work that is clearly not satisfactory. The bridge pin holes were in such a state that I had to fill and re-drill them. Below you can see a simple jig that I made to ensure that when I re-drilled the holes, they were centred exactly where I wanted them to be. Nice to see my little Martin looking so sweet! Gary did an exemplary job (as usual) - it's so nice to meet a perfectionist who breathes so much love and life into every instrument he works on.